Worldwide participants attend exhibitions and conferences to network. With the great number of events per industry sector, how can you create a formal yet informal networking environment? Regardless if you are a delegate, exhibitor, speaker, sponsor, pre-registered or onsite visitor assistance through the business matchmaking process results in actual business interactions with target markets! Introducing Business Matchmaking - Outsmart Marketing focuses on meeting management and business matchmaking at business events, exhibitions and conferences. By effectively combining online technology together with a team of business matchmakers, event participants are profiled, provided access to an online matchmaking calendar with the ability to view and select exactly who they want to meet. Steps in business matchmaking - click here. BEE Statement: In terms of the DTI code we are categorised as an "Exempted Micro-Enterprise", and therefore may be automatically considered a B-BBEE level 4 contributor. 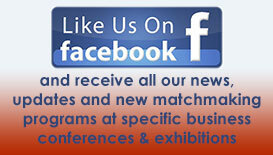 OUTsmart Marketing specializes in SMART Business Matchmaking through the exhibition and conference platform.